Head stone of John Bauchop located in the Arbon Cemetery, Blossburg. Webmaster's note: I felt the following tale should be told as it is one of those little stories that are handed down by word of mouth from generation to generation within a family. Many immigrants sold their homes and possessions in order to pay for their passage to America, only to be denied entry upon arriving because of health reasons. Their return passage cost them nothing but having sold everything to pay for the passage over there was nothing to return to. William B. Wilson was one of the young boys involved and it is ironic that as Secretary of Labor the Department of Immigration would fall under his jurisdiction. 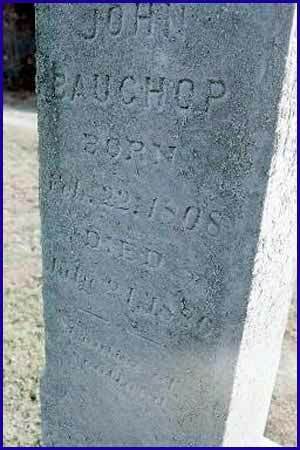 John Bauchop was the father of Helen Nelson Bauchop Wilson, William's mother. John had worked all his life as a blacksmith in Scotland. After years of watching the red hot coals of the smithy's fire, he lost his sight. Although he was blind his eyes were clear, therefore no one could tell he could not see by looking at his eyes. At the time he could not have legally come to America because of his blindness. When Helen and the children sailed to America, John was with them. During the passage from Scotland Helen's two young sons would lead John along the ship's deck one holding on to each of his hands. Everyone would see this and think that John was taking the young boys for a walk. John felt so comfortable being lead by the boys that when they landed in America no one questioned the elderly grandfather who was leading his two young grandsons one in each hand. Thus John Bauchop was able to get through the point of entry without being detected.